The lesson is; always carry your camera! We were having dinner guests and Maggie, realizing we needed a fresh baguette, asked me to trek the 100 yards from our house to the baker. So out I went, and as it’s my habit to always carry a camera, whether it is 100 yards or a hundred miles, it gave me the chance to pause on my walk back to take in the spectacle of this nameless corner in a small town, in the Luberon valley, in the southern part of Provence, just as nightfall brought a rapture to these old walls and hills. And to me. To stand here and breathe in the colors, because I believe you can breathe them in, how else to account for that surge of knowing something, which comes from standing still some place and simply being, breathing in the all of it in that particular moment. And so what if the moment is illuminated by street lamps and window light, and the colors may seem a little garish. In fact it is the union of the two competing sensations that brings them into their momentary harmony. Just to look at it all for what it is, is enough to fill me up with wonder about how remarkable, at any given moment, our world is. 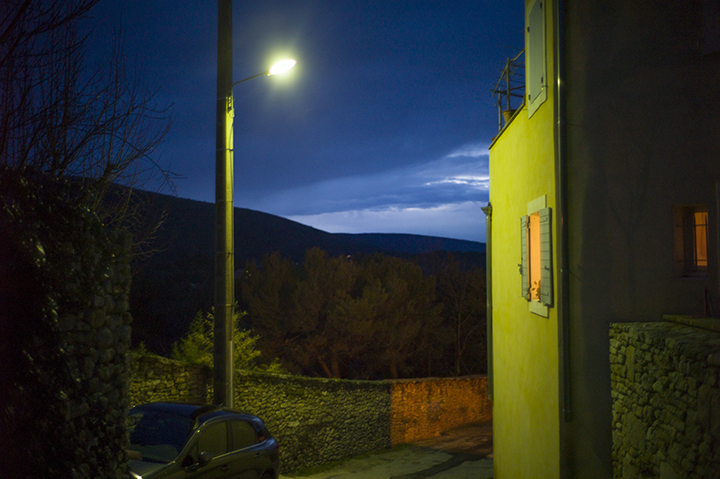 This entry was posted in Evening light and tagged Bonnieux, evening, France, lights, small town on January 24, 2015 by joelmeyerowitz2014. Yes, I know that to well. I visited your (phantastic) exhibition in Düsseldorf some weeks ago. On my way back to my car I saw a beautiful evening light above the Rhein, corresponding well with the city lights. What a light and such great colours. Maybe I was able to see it just because I saw your pictures right before it. Someone could write a book (and some one probably has) just about the way one colour next to another creates a certain mood. I love this picture.